Today is 150th Anniversary of the Burke and Wills Monument and both Melbourne and the monument have changed in the 150 years. Just after 4pm on 21 April 1865 the sculpture was unveiled in the middle of the Collins and Russell Streets intersection. The monument has been four different locations and these different locations show the history of Melbourne’s transportation with the introduction of trams, the city loop trains and the pedestrianised zone of the city square. 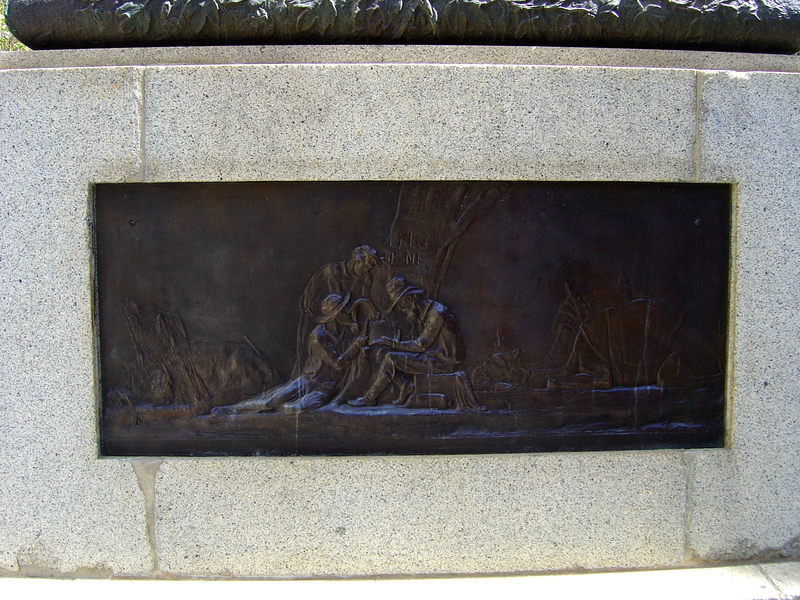 Proudly Australian the monument was made from local materials; the bronze from tin mined in Adelaide and copper from Beechworth, and the imposing plinth is of Harcourt granite. The sculpture was cast in Charles Summers’s workshop in the east end of Collins Street, now the location of Burlington Chambers. The casting of the sculpture before an invited audience was a bit of a fraud. Summers claimed that the figures were cast in one piece, an impossible accomplishment and one that the sculpture’s restoration has revealed to be false. Pouring hot metal is a spectacular event but Summers felt the need to lie about how successful it went. For a nineteenth century artist Summers worked hard at publicity. He was a celebrity as far as the Argos newspaper and Melbourne’s elite were concerned but what ever happened to its sculptor Charles Summers? Researching my book, Sculptures of Melbourne, I couldn’t help feeling that Summers was a man who, in part, believed his own publicity. I think that really believed that he was Melbourne’s Michelangelo but he was a bit of a fraud and a show off. After basking in the glory of his monument Summers moved to Rome, after all if was Michelangelo then he belonged in Rome. In Rome he established a factory for producing sculptures that his son, also a sculptor took over after his death. Summers never returned to Melbourne but his son did and there are Victorian neo-classical marbles by the Summers factory in both the Bendigo and Geelong art galleries. For more about the history of this and other public sculptures in Melbourne (and some better photographs) read my book, Sculptures of Melbourne. 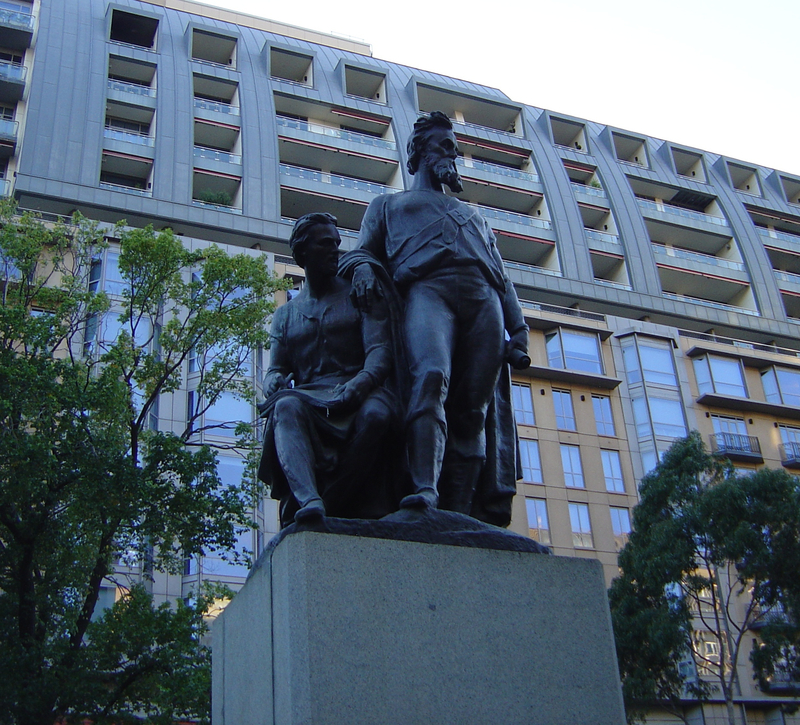 This entry was posted on Tuesday, April 21st, 2015 at 8:57 PM	and tagged with anniversary, bronze sculpture, Burke and Wills, Charles Summers, Collins Street, Melbourne, monuments and posted in Public Sculpture. You can follow any responses to this entry through the RSS 2.0 feed. Ha, it was their ‘bold self reliance’ that killed them. Keep that in mind sonny boy. ‘Bold self reliance’ means ignoring the Aboriginals (unlike the equivalent American Louis and Clarke expedition). Charles Web Gilbert’s sculpture of Cpt. Flinders a few blocks down also reminds me of the hazards of self-reliance. Web Gilbert didn’t use studio assistants and died of a heart attack in his studio while moving clay.